I don' know about you, but nowadays, in Bucharest the heat reached a high level and I am practically anesthetized by it! I t feels like Africa. 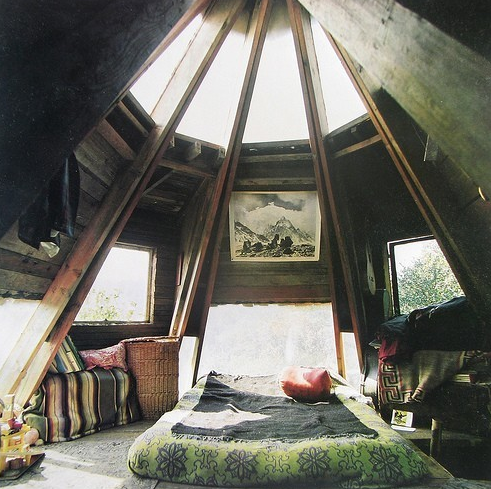 And on these hot days I can't think of anything more than a cozy and cool room where I can stay and read my books. Oh well,that is just dream, of course. Oh, and yes, the bed placed near the window it's a delight. Especially when you have a view. 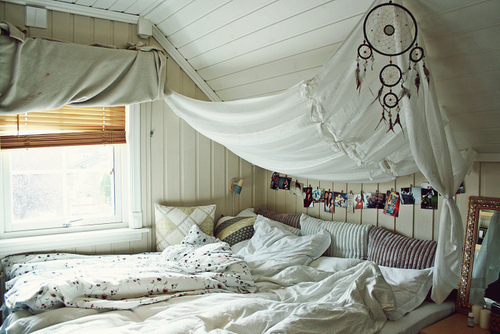 And a dream catcher is a must. Who likes nightmares, anyway? Another bed near a window, this time in another perception. What is better than a 5 o' clock tea, taken on your porch? 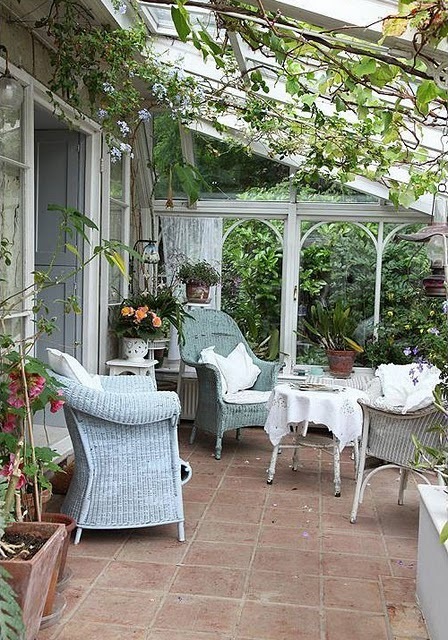 I tell you, a 5 o' clock tea in the garden,or in the greenhouse. And if you have vintage furniture, the better. Well, this is a bit to modern for my romantic taste, but I surely like the view. 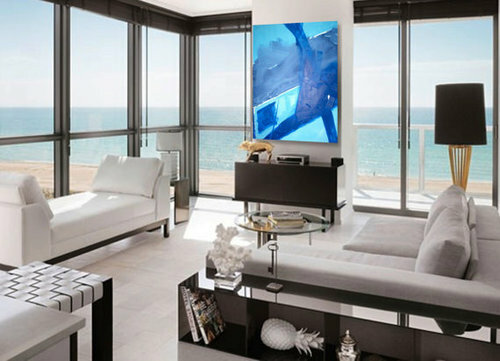 And the blue painting. It is the best solution to animate a dull interior. 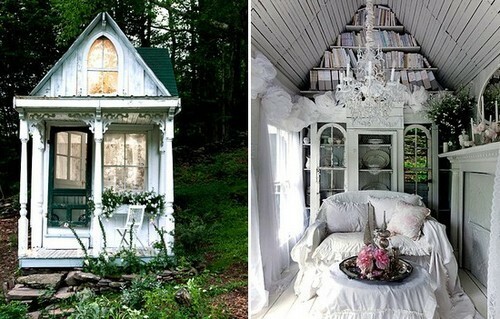 Oh, this is my dream tree house, or garden-house, you will say. The best place to retreat and enjoy a quiet summer afternoon. Damn! I really need this place! Now! 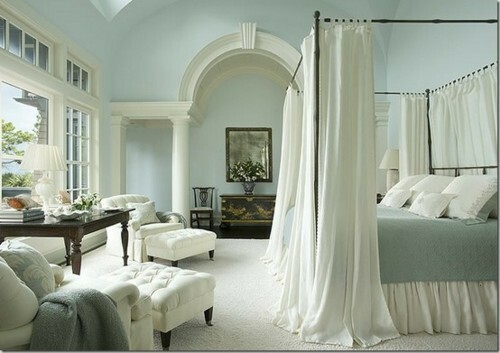 I always and forever love the effect of a canopy in a bedroom. Of course, you will need a big bedroom to make an arrangement like this. But the blending between white and grey-blue is possible. Especially for small, narrow spaces like Romanian apartments. What was I saying about tree houses? Well, I lied. This is it! :D Please, observe the structure. Doesn't it remind you of the indian's tents? I guess it has the same principle.